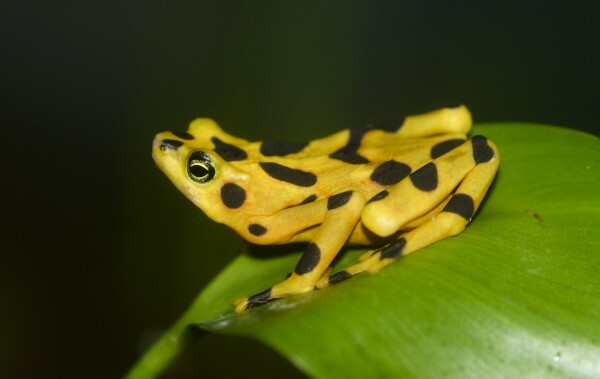 The loss of amphibian species across the world from chytridiomycosis, an infectious disease caused by the fungal pathogen Batrachochytrium dendrobatidis (Bd), has been described as “the most spectacular loss of vertebrate biodiversity due to disease in recorded history”. So it’s of grave concern that the pathogen has been discovered in Madagascar, an incredibly biodiverse region previously thought free of the fungus. Madagascar has the 12th highest rate of amphibian species richness in the world, with more than 400 species, 99% of which are indigenous to the region. But this biodiversity hotspot is already under severe pressure – a quarter of its species are under threat, according to the latest Global Amphibian Assessment. It’s rightly feared that the arrival of Bd, as reported in the journal Scientific Reports, could bring about mass amphibian decline – and even extinctions – as has been seen elsewhere. 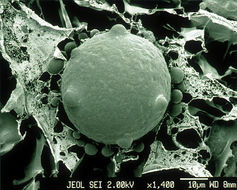 An scanning-electron micrograph image of a Chytrid fungus (Bd) spore. 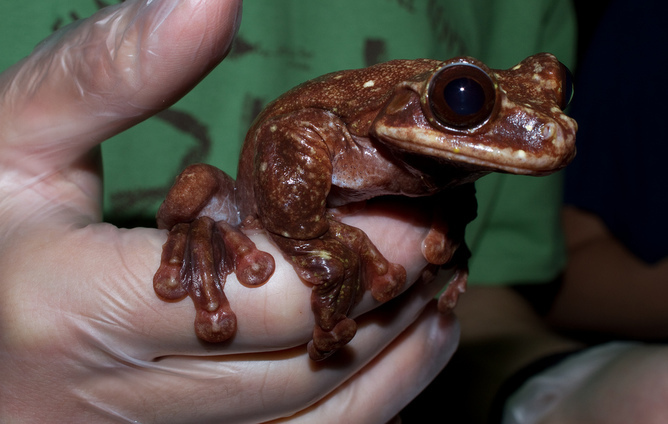 Testing of the samples of the Bd fungus found in Madagascar reveals the strain is closely related to BdGPL, the hyper-virulent lineage behind all the known outbreaks of the chytrid fungus pathogen that have decimated amphibian populations. However what’s interesting is that the rate of infection is extremely low and there’s no clinical signs of chytridiomycosis: the frogs have the fungus, but they haven’t developed the disease. This discovery presents us with a number of scenarios, which need further investigation. Perhaps the comprehensive monitoring plan put in place by A Conservation Strategy for the Amphibians of Madagascar (ACSAM) has worked as planned, in that the presence of the Bd pathogen has been detected – for the first time in 2010 – before amphibian declines have occurred. Perhaps the strain of Bd detected in Madagascar is not a virulent kind that poses a serious threat to amphibians. This was seen with the introduction of the BdCape fungus lineage into Mallorca, where it had little effect on the population of Alytes muletensis toads there. It’s possible that the Bd detected in Madagascar has been present on the island for a long time, but undetected. It may be an endemic, non-virulent lineage as seen in Brazil and Asia, where certain lineages endemic to the regions appear to have evolved alongside the native amphibians. Or perhaps there is an endemic, previously undetected chytrid fungus on the island, related or not to Bd, which could be acting as a buffer for local amphibians against the invasion of BdGPL – acting, in effect, as a natural vaccine. Alternatively, Malagasy amphibians may have developed some intrinsic resistance to Bd, for example through protective bacteria in their skin. This could explain the low infection rates and the ambiguous test results reported in the paper showing that some Bd-positive samples did not conform to any known lineage of the fungus. Although rare, resistance to BdGPL is not unprecedented – this has been seen and documented in Brazil. The last known surviving Rabb’s Fringe-limbed Treefrog, a species ravaged by the Bd fungus. The first scenario would be a disaster – and should be a priority. If this turns out to be the case, the survival of Malagasy amphibians could depend on the conservation and scientific groups involved in ACSAM managing to restrict the spread of the disease. Tackling invasive species such as the Asian Toad that might spread the disease and ensuring tourists and researchers stick to strict hygiene protocols would be necessary. Perhaps even more drastic conservation measures, such as capturing animals from particularly vulnerable species for raising in captivity. On the other hand, the fourth scenario presents an intriguing possibility: if it’s the case that Malagasy amphibians are resisting a fungal invasion, discovering how this works could provide crucial information to help save amphibians elsewhere from the disease. The research on the amphibian skin microbiome, for example, and its role in the creature’s immune system is producing some exciting results. It’s also apparent that the diversity of the Chytrid fungus species as a whole, and in particular of Bd, has not been appreciated. It’s possible there are many types of chytrid fungus associated with amphibians that we’re not yet aware of which provide some protection against BdGPL. So without a doubt, this report will sound warning bells loud and clear for conservationists, and Bd’s appearance in Madagascar could still result in a huge loss of amphibians. However, the lack of chytridiomycosis symptoms also suggest there’s something special in Madagascar that could yield a breakthrough in how the disease spreads – something that may not only benefit Malagasy amphibians, but those throughout the world.